DO YOU LIKE SHORT STORIES? I like short stories, and one place you can find several of them, besides magazines, is in an anthology. Anthologies are something apart from everything else. They are a collection of short stories, at least two or three novellas by different authors and I don’t know what the ceiling is on short stories. What you get with an anthology is like a sampler box of chocolates. Read one of these, then taste one of those. Here’s a different one I found. This anthology, the one I just finished, is something apart from other anthologies. It has a theme like the others on the shelf but that’s where the similarity ends. What grabbed me when I saw the book was not the cover, though it’s a compelling one, but the title. Better said, subtitle. “Leaving Earth.” That one forced me to take a closer look. I had to know. Now I do. 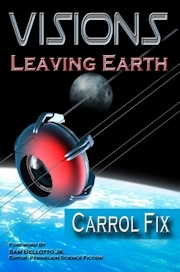 Twenty-five really good short stories about leaving Earth, of all things. Did that make sense? Never mind. The authors have done justice to the genre of science fiction, too. Some “hard” science fiction and some not so hard, but all great stories. I didn’t know an imagination could fly that high. I can’t review each story because that would turn into a book about a book. Suffice to say, all of them are beautifully written; every one a winner on its own. One of the other nice things about this anthology is that the stories are short enough to read one on a coffee break, maybe a couple at lunch. I do recommend that the book be read in pieces because, if read at one sitting, the mind will be subjected to overload. One or two at a time is the way to go with this one. The first story, “Tumbleweed,” was written by Carrol Fix, who also edited the book. It was an interesting story with a sharp edge on it and I can tell you that if I see anything else by this author, I’ll definitely grab it. It gave a whole new dimension to what leaving Earth is—and isn’t. I found “Retribution” by Harry Alexiou to be an incredible product of a soaring imagination and dark humor that caused me to tremble—just a little. The writing was smooth, as is true of all these stories. “Godzilla and Icarus” by Amos Parker was a real hoot with unusual strength in the telling. “Time is Up” by S.M. Kraftchak had me scratching my head for days. What an experience into strange that one was. Each of these stories gets its characters off Earth in its own way, and each adventure is unique. Twenty-five wonderful and wild stories by twenty-three capable authors. Every one of them was more than worth the short time it took to read them, and a couple of the stories are still churning around in my head.